Arizona is more vulnerable than ever. Can the Utes beat the 'Cats for a second time in Pac-12 history? Utah is 1-13 vs. Arizona in Pac-12 play, including an overtime loss in January. More than 15,000 fans packed the Huntsman Center on that Saturday afternoon in February 2016, when guard Brandon Taylor scored 15 of Utah's 30 second-half points, center Jakob Poeltl posted a double-double and the Utes finally beat Arizona. Utah coach Larry Krystkowiak spoke afterward of “a pretty darned good feeling.” The Utes would love to recapture that moment Thursday night, staging another “Red Out” promotion. Only once this season has Utah announced attendance of 12,000-plus fans. The Utes haven’t appeared in the NCAA Tournament since the 2016 team earned a No. 3 seed. And that 70-64 win remains Utah’s only victory over Arizona in the program’s Pac-12 era, against 13 losses — including an 84-81 overtime defeat last month in Tucson, Ariz.
Washington has capitalized on Arizona’s struggles, winning last week in Tucson and taking command of the Pac-12 race. 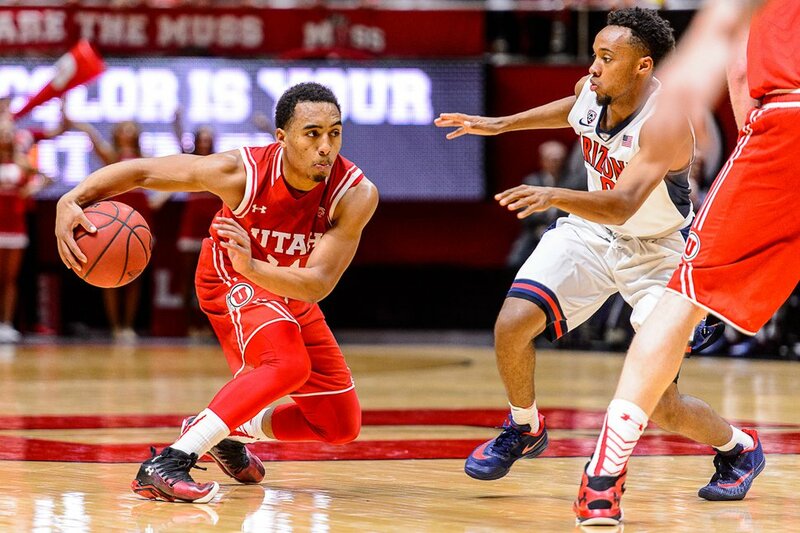 The immediate question for the Utes is whether they exploit a Wildcat team that’s more vulnerable than ever, and increase their chances of landing a top-four seed in the Pac-12 tournament. In the bigger picture, observers wonder if 10th-year Arizona coach Sean Miller can weather the issues hovering around the program and how quickly the Wildcats can re-establish themselves with a No. 1-ranked 2019 recruiting class that features Nico Mannion, the son of former Ute/Jazz guard Pace Mannion. Trent Nelson | The Salt Lake Tribune Utah Utes guard Brandon Taylor (11) defended by Arizona Wildcats guard Parker Jackson-Cartwright (0), as Utah hosts Arizona, NCAA basketball at the Huntsman Center in Salt Lake City, Saturday February 27, 2016. The Wildcats are not their usual, successful selves. Arizona’s current five-game losing streak is the program’s longest since 1983, legendary coach Lute Olson’s first season. Arizona’s downturn plays prominently into the theme of a downtrodden Pac-12, much like USC’s losing season in football. If the 'Cats are trending poorly, the conference is crumbling in basketball. That’s both the perception and the reality that stem from Arizona’s performance on the court and a federal investigation into recruiting practices. Arizona coach Sean Miller is expected to be subpoenaed during a federal trial in April, Yahoo sports reported. In an unrelated case, the school is moving toward terminating assistant coach Mark Phelps. But then the Wildcats lost 67-60 to Washington and fell 69-55 to a Washington State team that entered the week 1-8 in Pac-12 play, before sweeping the Arizona schools on the road. Injuries to center Chase Jeter and guard Brandon Williams have hurt the Wildcats during their losing streak. The state of the Pac-12 is such that Arizona (5-6) is only two games out of second place — but is in a three-way tie for eighth. ESPN’s Basketball Power Index projects a ninth-place finish for the Wildcats. That’s would be a very unfamiliar position for Miller, who managed to regroup and win the Pac-12 tournament last March, even after some turmoil in February. Records: Arizona 14-10 (5-6 Pac-12); Utah 13-10 (7-4). Series history: Arizona leads, 34-29. Last meeting: Arizona 84, Utah 81 OT (Jan. 5). About the Wildcats: Arizona is Utah’s first of seven repeat opponents in the Pac-12 schedule, after Parker Van Dyke’s would-be winning shot rimmed out in Tucson last month. Wasatch Academy product Emmanuel Akot left the program soon after that. … The Wildcats are 3-6 since then, with a five-game losing streak. … Arizona is 2-3 on the road in Pac-12 play; Utah is 2-3 at home. … In the Wildcats’ last five losses, center Chase Jeter missed two games and guard Brandon Williams missed three. ... The ESPNU announcers are Dave Pasch and Bill Walton. About the Utes: Van Dyke’s buzzer-beating shot for the win at UCLA last Saturday was the first such ending of a game in coach Larry Krystkowiak’s eight-year tenure. The last time that happened for Utah was in February 2011, when Chris Hines’ banked-in 3-pointer beat New Mexico. … Utah rallied from 17 points down in the first half to win at Arizona State in January and trailed UCLA by 22 points with 12 minutes left. The Utes also lost a 14-point lead by halftime of Oregon’s win.